This technique of machine stitching on to Lutradur can be used for all types of projects. This pretty little leaf is the size and shape of a birch leaf. (Admittedly, it should have serrated edges, but this one is plain). All of the stitch is free motion machine stitching using variegated cotton thread. If you would like to try making one for yourself, start with a piece of Lutradur; this is Lutradur 70gsm which has been transfer dyed on both sides, but you could paint it if you wish using acrylic or fabric paint which has been thinned down a little. Begin by stitching the edges; if you don’t feel comfortable doing this without a pattern, trace a picture, or find a leaf and draw round the edges straight on to the Lutradur. Your stitching with hide the pencil marks. 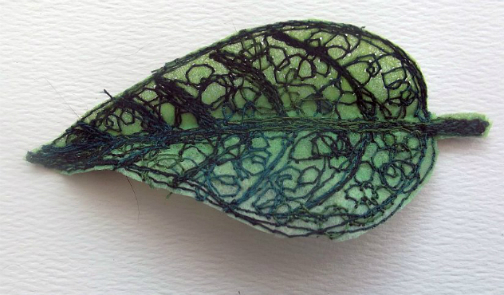 When you have stitched the edges of the leaf, sew the central line a couple of times and then the veins. Make sure you stitch these several times as it’s important that they stand out. Then, fill in the main body of the leaf by making small circles in stitch. You can go over the stitched veins as they won’t be visible in the completed the piece. When you’ve finished, cut the leaf out using a pair of sharp embroidery scissors. If you’d like a more delicate look, use a heat gun to melt away some of the Lutradur, but please remember to wear a mask as a precaution. These pretty little leaves would look lovely on a brooch or corsage, or you could use them to embellish a quilt or wall hanging.